If you want to be successful in any aspect of life, you have to plan ahead — and that is absolutely true when it comes to food and healthy eating. I'm a busy woman — I founded my activewear line 25 years ago and continue to expand the business today. 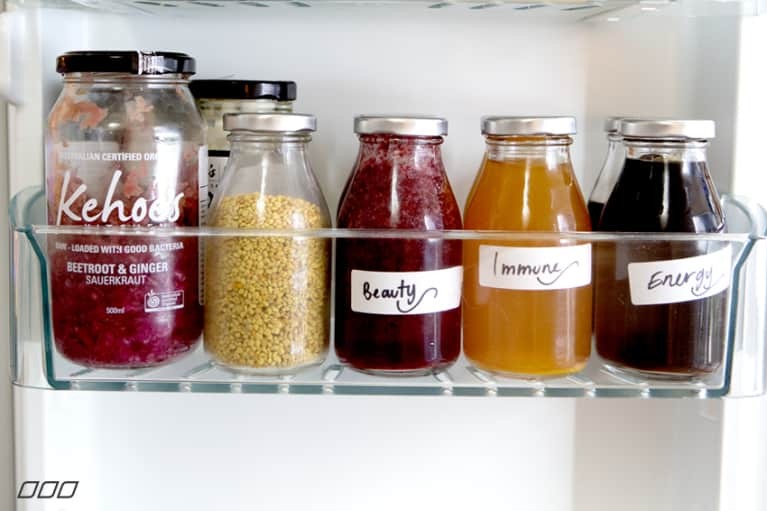 I find that organizing my fridge is as important to my routine as brushing my teeth. It helps me start each and every week on a healthy note. 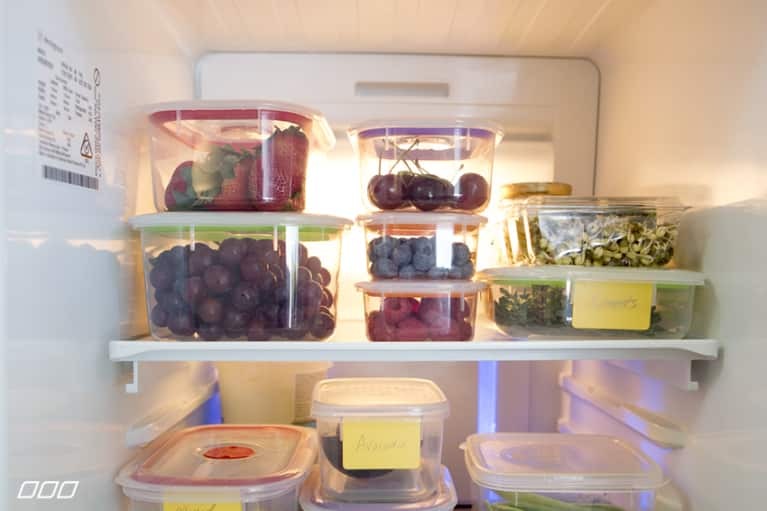 When you’re organized and prepared, it’s a lot easier to make the best possible food choices that will give you optimum energy and leave you feeling amazing. On Sunday mornings, I make a trip to my local farmers market to collect the best in-season fruits and vegetables, and then visit our local butcher and fish shop for quality protein. When I get home, I plan and prepare foods for the week ahead based on the ingredients I have found. I put a few hours aside every Sunday to plan my meals for the week. 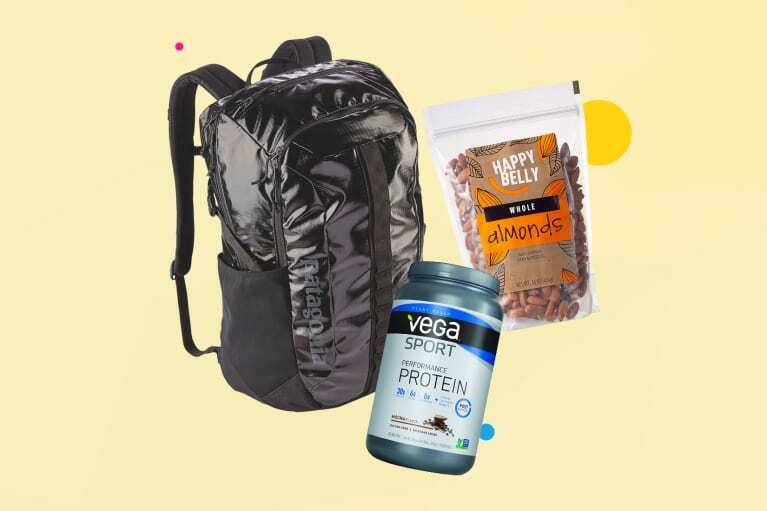 This usually involves making a big batch of soup and protein balls, whipping up a few of my favorite dips for snacks, and popping my favorite smoothie ingredients into zipper bags, then into the freezer, so breakfast is ready to blend at a moment’s notice. 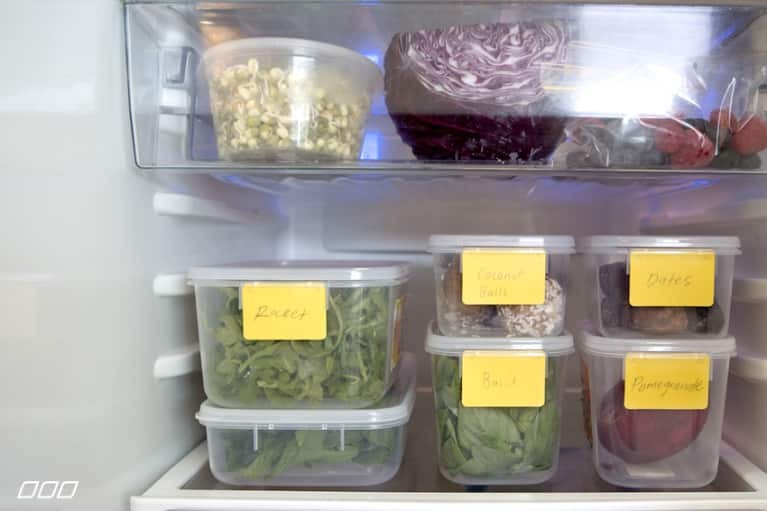 Here is how I stock my fridge for a week of healthy eats! On the top shelf, I keep ready-to-eat berries and grapes that I can add to yogurt, and a selection of sprouts for an extra nutrient hit. On that same shelf, I keep condiments such as homemade pesto and other dressings. They're great to have handy to add flavor to my meals. On the second shelf, I keep dinner ingredients for the week such as mixed greens, spinach, and avocado. In the drawer, I keep small plastic bags of portioned berries, sprouts. and purple cabbage to add to fresh salads. Having food portioned out in advance, such as the berries in bags, makes my morning routine that extra little bit easier. After my workout I can come home and whip up a smoothie and throw a homemade lunch together before I head to the office. On the third shelf I keep arugula, mint, and basil. Using herbs is a quick and easy way to add flavor to any smoothie or meal you might have. I always check what’s growing in the garden or what’s at the farmers market. I also stock my fridge with coconut bliss balls for snacking and fresh medjool dates. Having sweet treats made with dates and coconut oil seriously satisfies those sweet cravings that strike after dinner. I also keep fresh pomegranate to add to my breakfast, salad, or yogurt. I stock the top drawer with veggies. This week I had pumpkin, carrots, parsnips, celery, asparagus, and yellow peppers. 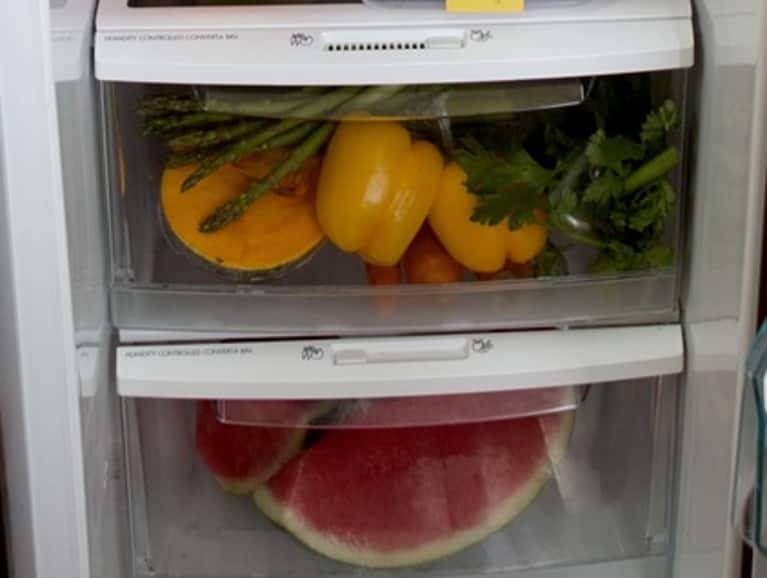 What I keep in the second drawer depends on what is in season; right now that's watermelon (I live in Australia). It's hard to tell from this photo, but this is where I usually store some premade dinners. This week, there's poached chicken, turkey mince, and frittata and turkey patties. There is also a broccoli soup that is defrosting from the freezer. Immune tonic (orange, ginger, turmeric, honey): This one is full of vitamin c and has anti-inflammatory properties from the turmeric, and it’s great for sore throats, with antibacterial Manuka honey. Beauty tonic (mixed berry, orange, and chia): Berries are loaded with antioxidants to help beat free radicals that can cause aging, and chia seeds are loaded with essential fatty acids that help keep skin moist. Energy (cold-pressed coffee, sugar, cacao, cayenne): I love cold-pressed coffee; it’s 70 percent less acidic in the body due to the extraction process. Cayenne pepper also increases circulation and blood flow to the brain to help you feel alert and energized. What you can see from this photo is that the door is also stocked with real milk, organic yogurt, eggs, organic butter, organic Parmesan, homemade chicken broth, olives, feta, and sun-dried tomatoes. 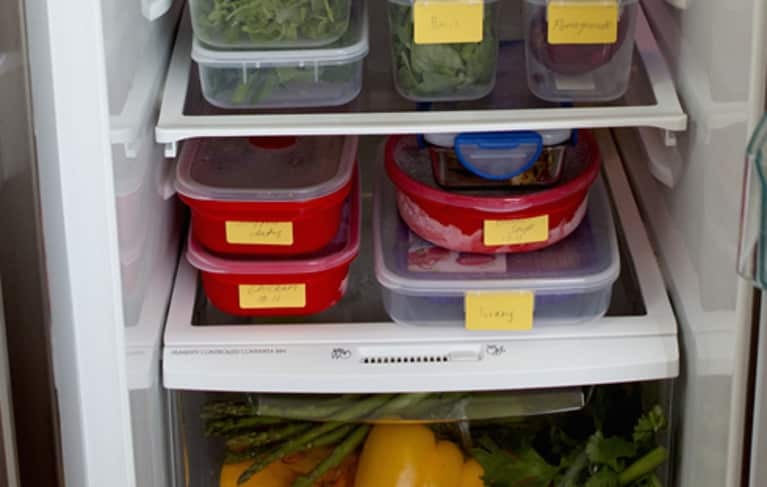 Stocking your fridge this way will help you set your week up for healthy-eating success!